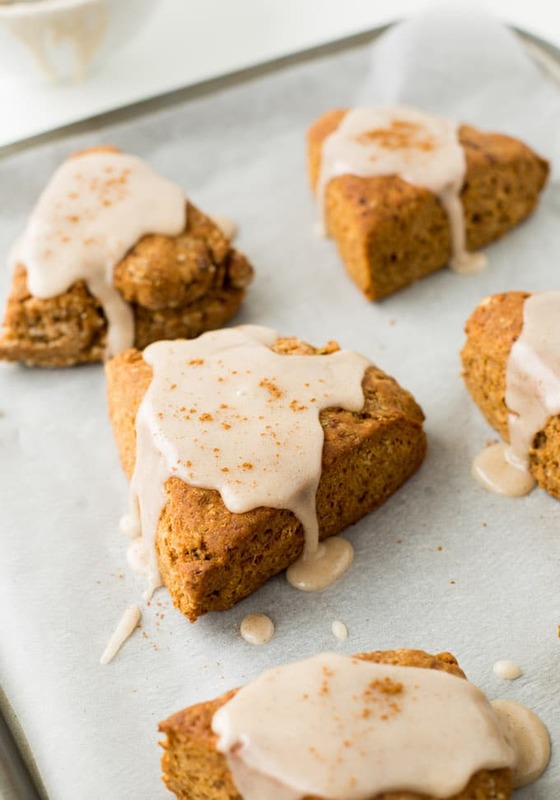 Gluten Free Vegan Gingerbread Scones with a simple, maple glazed top – made in one bowl & easy to make! November 15th is a perfectly reasonable time to start getting into Christmas mode, yeah? Please say yes because these scones are happening either way! Who’s ready for a scone? 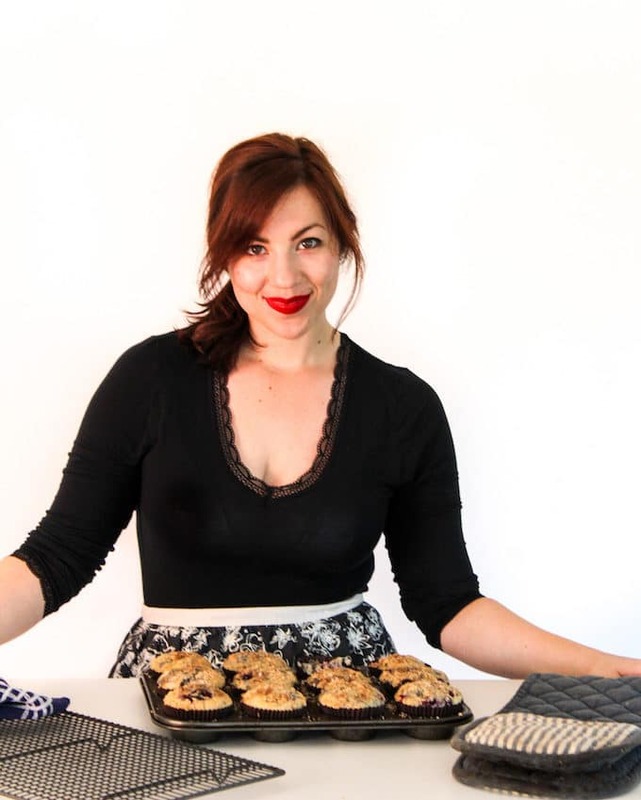 Since my blueberry scones have been getting quite a lot of love lately I figured it was time for a little recipe revamp. Any excuse for a little baking, am I right? The base recipe for these scones is pretty similar with a few small changes adding gingerbread spices: ginger, cloves, and cinnamon along with a touch of molasses for that authentic gingerbread feel. Making these is a simple affair – it’s basically just a matter of whisking together your dry ingredients, cutting in your softened coconut oil and then finally mixing in the coconut milk. I do recommend using full fat coconut milk here – I think the fat gives the scones a little extra bit of softness. Also make sure to let these sit in the fridge for at least 30 minutes before baking. It’s important that the coconut oil has the chance to firm up in the fridge so that the scones hold their shape while baking. Like a lot of gluten free + vegan baked goods these scones really are best eaten fresh. After a while they can get a bit hard. If/when that happens it’s an easy enough fix! Just pop them in the microwave for 20-30 seconds or place them in the oven at a low heat to warm them up again and they are good as new. 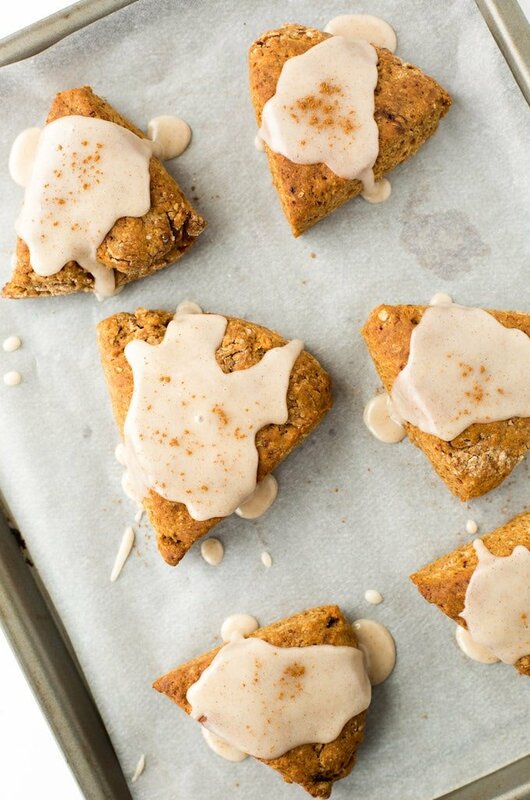 Don’t forget to #asaucykitchen on instagram if you try these Gluten Free Vegan Gingerbread Scones! We love seeing what you make! You can also post your pictures to my facebook page! 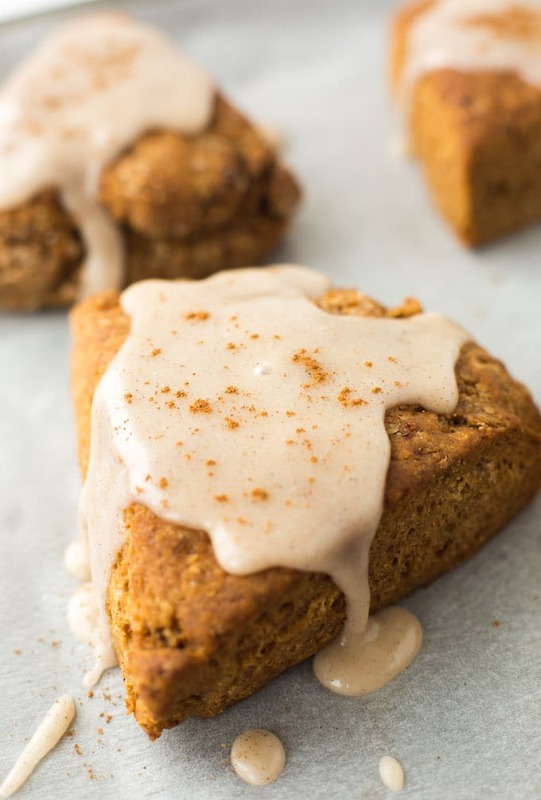 Gluten Free Vegan Gingerbread Scones with a simple, maple glazed top - made in one bowl & easy to make! Whisk together the flour sugar, baking powder, salt, cinnamon, cloves and ginger together in a large mixing bowl and combine. Add the coconut oil to the flour and use a fork to mix into the flour. Mix until the coconut oil is well combined. Your mixture should be powdery & dry. Add the coconut milk and the molasses to the bowl and stir until a soft dough forms. Turn the dough out onto a sheet of lightly floured parchment paper. Mould the dough into a round disk, about 7 inches wide and 1 1/2 -2 inches tall. Cut the dough into 6 wedges. Place the dough in the fridge for at least 30 minutes. Don't skip this step - the coconut oil needs to harden up so the scones don't spread too much while baking. Preheat the oven to 400°F/200°C. When you're ready to bake transfer the dough to a baking sheet, pull the wedges apart leaving space between each wedge (at least 2 inches). Sprinkle with course sugar and bake for 20-22 minutes until the scones have risen and are golden in colour. Mix together the powdered sugar and maple syrup in a small bowl until you get a thick glaze. Start with 1 tablespoon of maple and add an additional tablespoon if you need a more fluid glaze. Drizzle the glaze over the top and enjoy! Prep times includes 30 minutes of chilling the dough. If you use xanthan gum just mix it in with the rest of the dry ingredients. These are best enjoyed fresh the day you make them. If you have any leftovers I recommend warming them up in the microwave or on a low heat in the oven before eating them and they'll be good as new! You can make coconut powdered sugar in a blender if you want to make these refined sugar free. Just add your sugar to a blender and blend until you have a soft, powdery sugar.